here are three basic results in a chess game: win, loss or draw. There are many different situations which bring about these results. The are a number of ways in which a chess game between two players can be won. First, a win can be earned by checkmating the opponent. This occurs when the King is in under attack or in "check" and every possible move by the King will also put it in check. Second, a win can be earned when one player resigns the game… in effect, this means they have surrendered. This usually occurs when one side has developed a decisive advantage and the losing player does not want to play the position further. This is proper etiquette when a position is totally hopeless. Thirdly, a win can be earned when an opponent's time has expired before they have made the required number of moves in the given time allotment. In tournament play, each side has a certain time period to complete a set number of moves. If a player does not accomplish this, the other player can claim a time forfeit. Draw by mutual agreement occurs when both players decide that the position is equal for both sides and with best play, the game would end in a draw. This is the most common way a draw is reached. When two Kings remain on the board the game is immediately drawn because the two opposing Kings cannot deliver checkmate to each other. Insufficient mating material occurs when a player does not have the material to force a winning position. 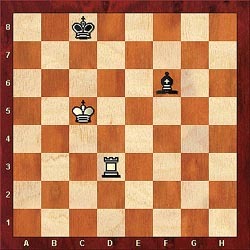 For example, a lone Bishop or a lone Knight cannot force a win or deliver checkmate. 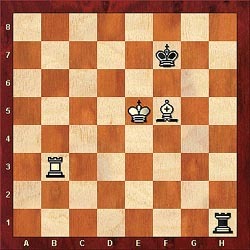 Two Knights normally cannot deliever checkmate, but there are exceptions (See Chess Ending Lab #1 - Problem #9). Insufficient losing chances occurs in tournaments when a player makes a draw claim on the basis that his opponent cannot force a win (see Diagram #1 on the right). In some cases, the Tournament Director (TD) or Arbiter will rule immediately; in other cases, they may instruct that the game be continued and the weaker side must demonstrate that the opponent cannot win. In the old days, play could go on indefinitely, or would be adjourned and completed in between rounds on the following day. This led to some interesting outcomes. I remember two cases (in the 80s) where this rule could have affected the outcome. In the first case, one player didn't know the Bishop and Knight mate, but after the adjournment, went home and learned it! 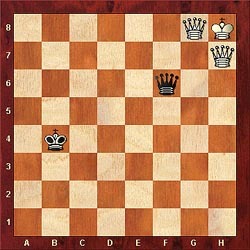 In the second case, one player had a Rook and Bishop against a Rook (similar to Diagram #2 on right). The player with the Rook was visibly upset that the other player wouldn't agree to a draw. However, the arbiters let play continue until the player with the extra piece missed an easy win. An article on the same ending had appeared in U.S. Chess magazine months earlier! Perpetual check occurs when one player has an endless series of checks from which their opponent cannot escape. In Diagram #3, Black can continue to check along three different lines to achieve a draw. (See Chess Ending Lab #1 - Problem #22). Also remember the "super-Rook" theme! Three-fold repetition occurs when an identical position is repeated three times. This repetition does not have to be in consecutive moves. In Diagram #3, black can force a three-fold repetition. White does not have to cooperate, but the position may turn out worse. This position was Game #5 from the famous Kasparov-Deep Junior match. The 50-move rule occurs when the player with the stronger side cannot demonstrate winning technique within 50 consecutive moves. 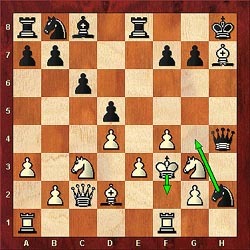 However, if a pawn is moved or material exchanges occur for either side, the count starts over. There have been exceptions made in some endings where 50 moves may not be adequate even with best play (for example, Rook and Bishop vs. Rook). Adjustments are made in this case. Chess is a brutal game and losses are unavoidable. I lost my first game to a four-move "Scholar's Mate" and I have also lost a few games only one move from victory. These are brutal defeats, but they build character and… they tend to balance themselves out… thank goodness! If you are a beginner, play as much as possible and learn from your losses. It may be helpful to analyze your games with an advanced player, but make sure this person doesn't stunt your ideas. After an emotional game involving a loss, do not look at the game right away. If you are calm after a loss, it is usually helpful to get your opponent's views. However, beware of the opponent who claims to be right in every variation because they won. If this is the case, politely excuse yourself from the session. It is also helpful to get a sparring partner to play a series of games in the variations you are having trouble with. Play both colors. Deeply annotate your games… especially the losses. It may be best to analyze the game on the board before cranking up the computer database.